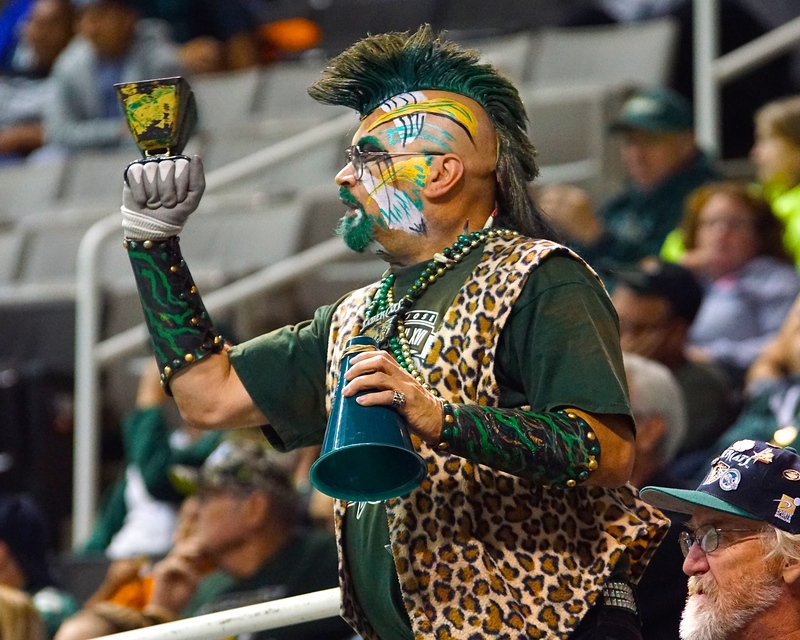 SAN JOSE, CALIFORNIA–The San Jose SaberCats (5-0, 1-0) defeated the Portland Thunder (2-3, 1-1) 64-45, Saturday Night at the SAP Center, in front of 7,125 fans on “Feed the Community Night”. The SaberCats went up early and poured it on often, but needed to hold off a late rally by the Thunder to remain unbeaten. With the defense continuing to be the backbone for San Jose, the offense was able to take advantage of great field position and blown coverage by Portland to jump out to a commanding 37-6 lead with three minutes remaining in the second quarter. Quarterback Erik Meyer found receiver Darius Reynolds early in the first quarter, as Reynolds fought his way through a pass interference call, for a 20-yard touchdown catch. Meyer completed 20-of-30 passes for 283 yards and followed his eight touchdown passes last week with seven against the Thunder on Saturday. 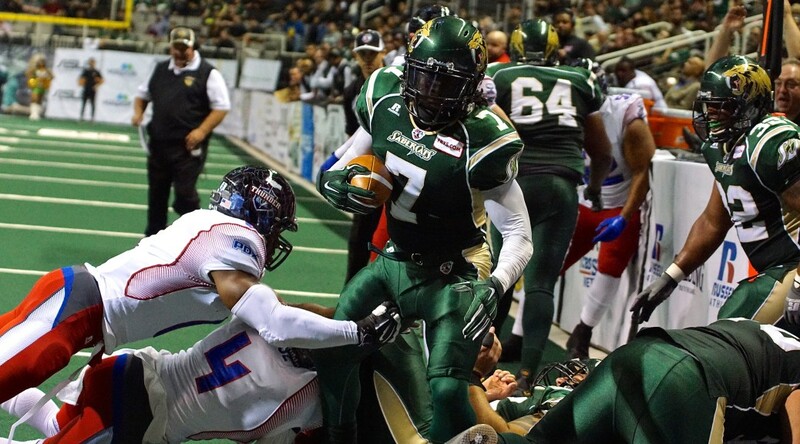 An immediate impact since joining the team two weeks ago against the Tampa Bay Storm, SaberCats receiver D.J. Stephens continued to shine. 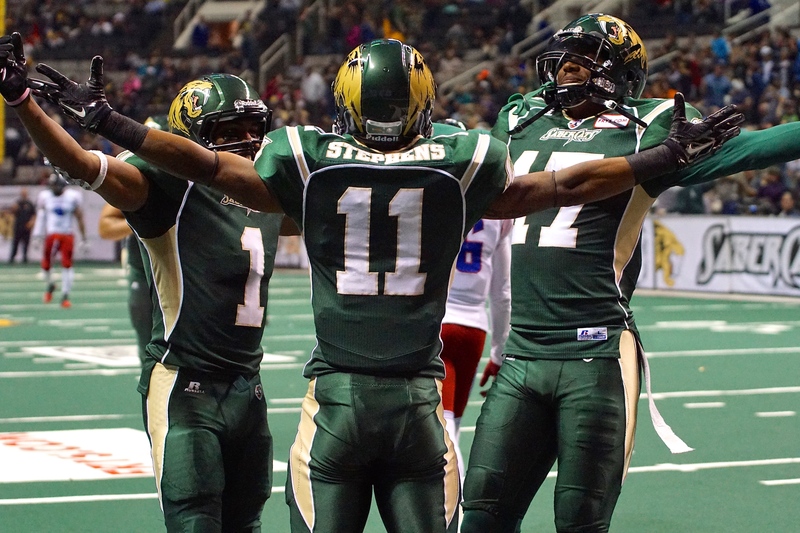 Stephens led the SaberCats with 10 receptions for 171 yards and three touchdowns, including deep routes for scores of 35 and 43 yards. 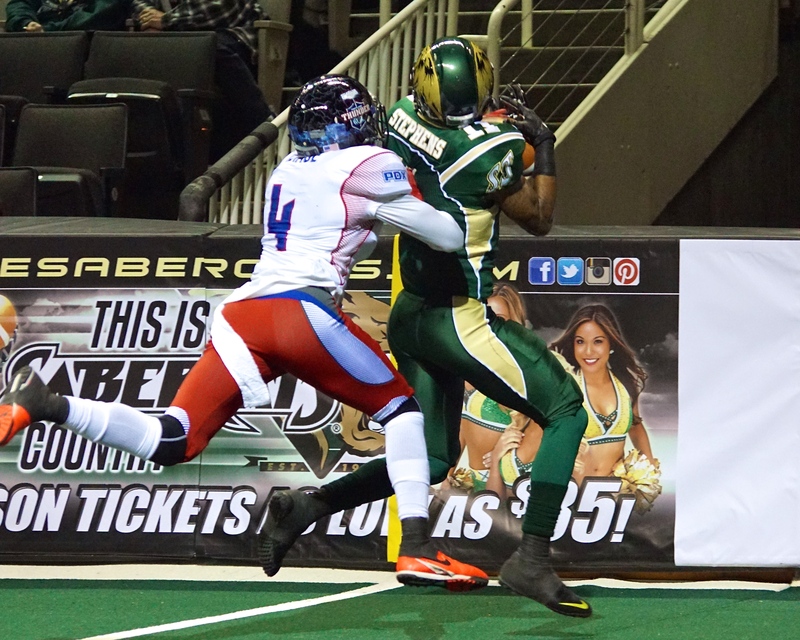 With no regard for his safety, Thunder wide receiver Perez Ashford hauled in a 13-yard touchdown reception while flipping over the boards to cut the San Jose lead to 10, at 16-6 as the first quarter came to an end. 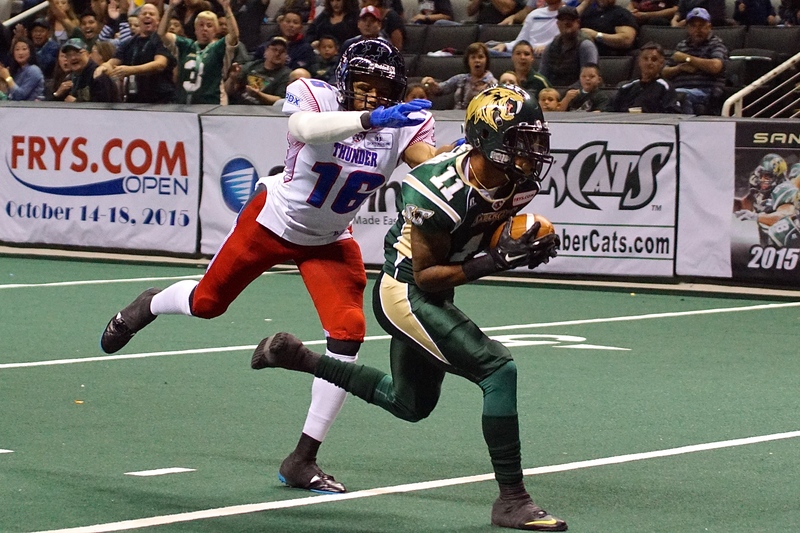 Ashford was a bright spot for the Thunder, grabbing six receptions for 78 yards and the one touchdown. 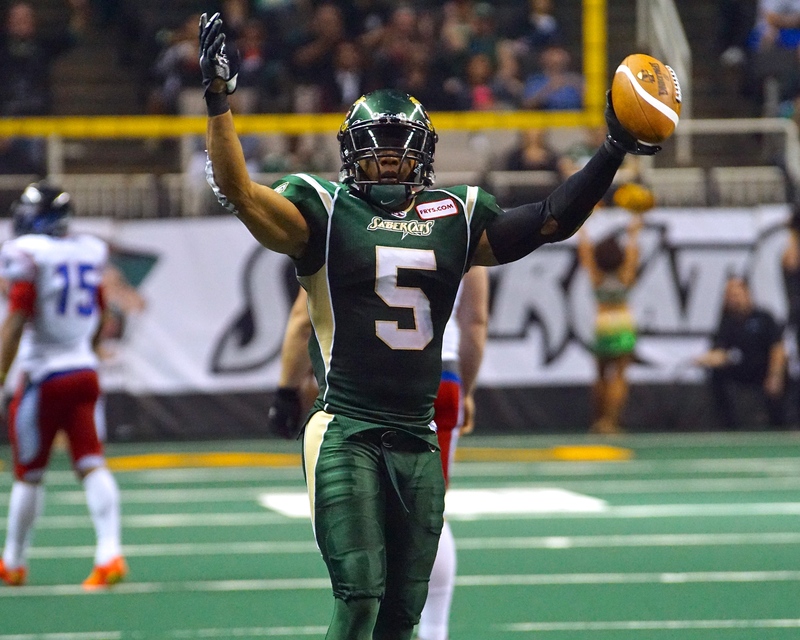 Pacing the league-leading defense for San Jose was defensive back Ken Fontenette. Fontenette, the team’s leading tackler, added an interception off of an errant Kyle Rowley pass intended for Howard in the second quarter, leading to a nine-yard touchdown reception by Gray. 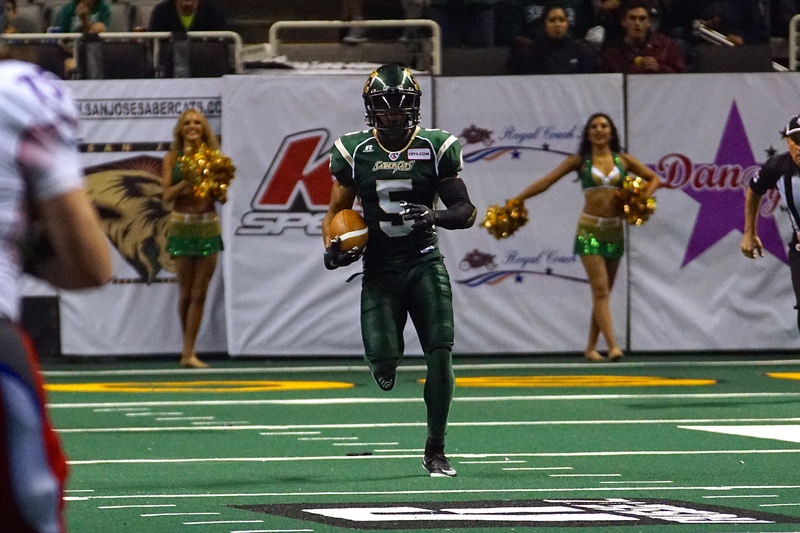 Continuing their defensive prowess, David Hyland also had an interception in the fourth quarter, as the SaberCats defense prevented the Thunder offense from connecting on four of its five third down conversions. 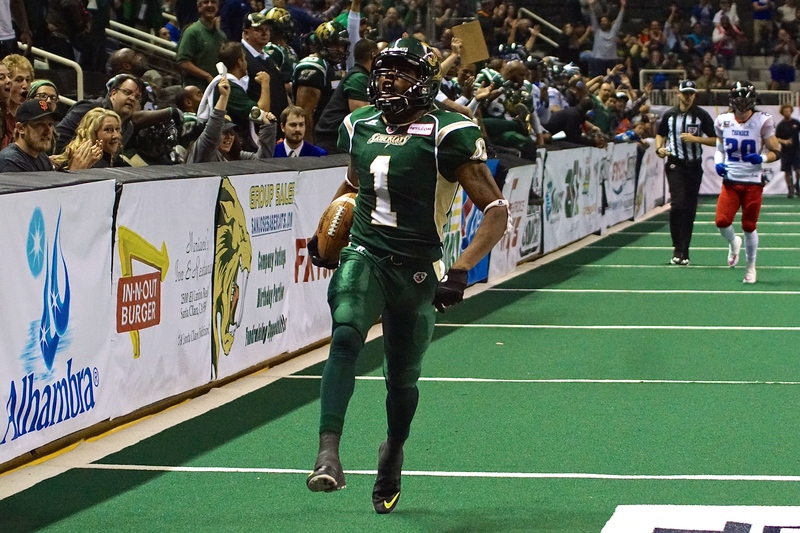 In the second quarter, Thunder receiver Jamar Howard fell over the wall into the crowd injuring himself and was unable to return to action. The league leader in touchdown receptions (13), finished with two receptions for 25 yards. Acquired earlier this week, Portland’s Jared Perry grabbed a 26-yard touchdown in the corner of the end zone, his first of the season. His score made it 37-12. 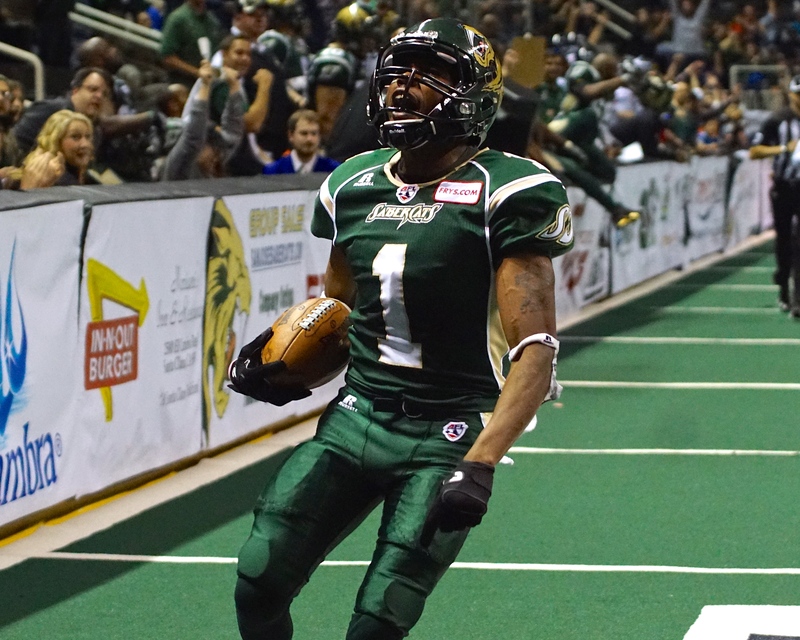 Perry, the 2012 AFL Rookie of the Year, finished with six receptions for 54 yards and the touchdown. With less than a minute remaining in the first half, Quincy Butler intercepted a Meyer pass to give Portland great field position. 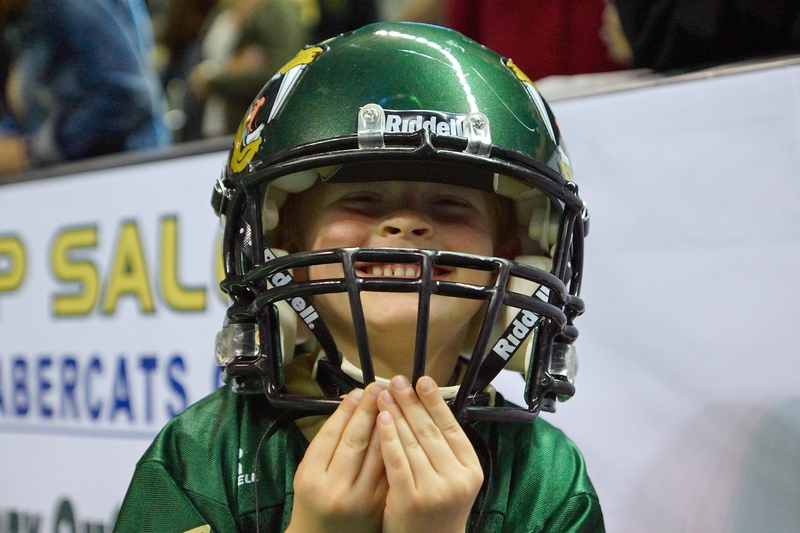 The Thunder were able to benefit from the turnover, and scored on a one-yard touchdown run by John Martinez, bringing the SaberCats lead to 44-19 at halftime. Portland came out strong in the third quarter, first on an eight yard touchdown reception by V’Keon Lacey, and again on the ensuing kickoff when Osagie Odiase, a rookie out of Sacramento State University, recovered the fumble in the end zone to bring Portland’s deficit to 51-32 at the end of the third quarter. 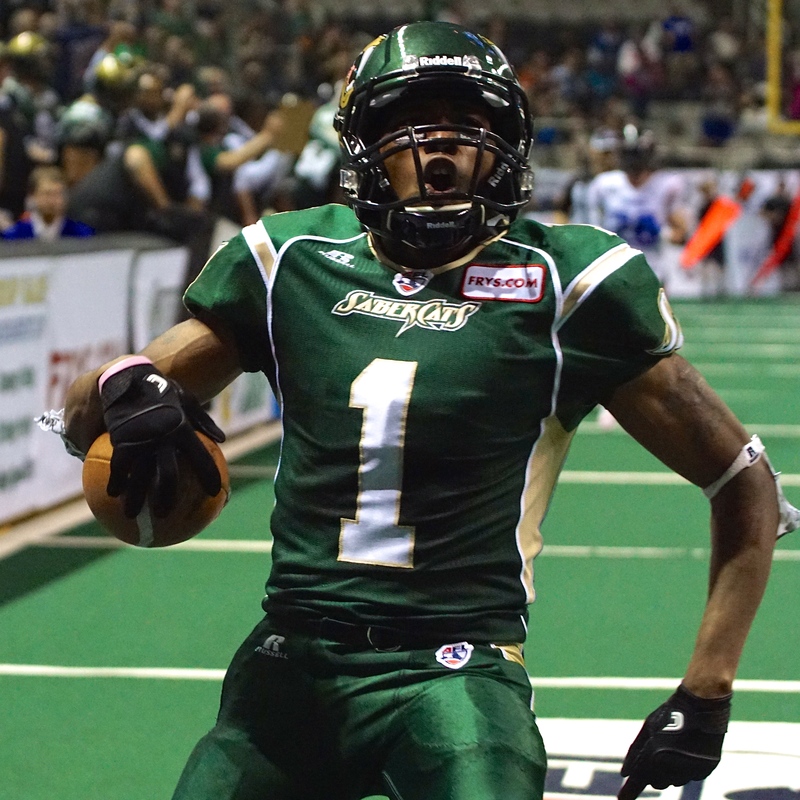 Lacey hauled in eight receptions for 77 yards and led the Thunder with two touchdowns. For the second straight week, “Big Play” Reggie Gray ran back a kickoff for a touchdown, this time for 56-yards. He had his second receiving touchdown of the game in the fourth quarter, an 11-yard strike from Meyer to put San Jose ahead, 58-32. Gray finished with 70 receiving yards and three total touchdowns. “We all can be number one guys on team but we all come together on this team and make it a cohesive unit,” said Gray. San Jose is off to its best start since starting 4-0 in 2002, when they won the first franchise ArenaBowl Championship. 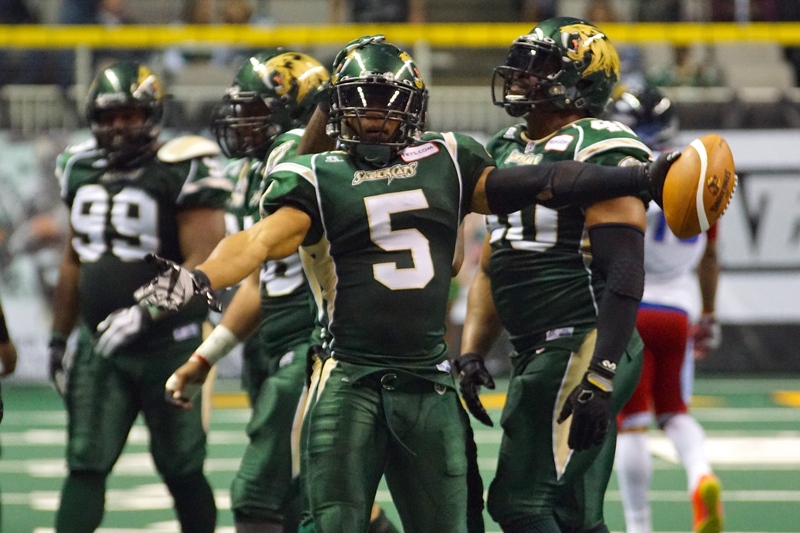 The SaberCats will travel to Arizona next Saturday May 2nd, in a National Conference showdown with the Rattlers.